It’s the season for home improvement. 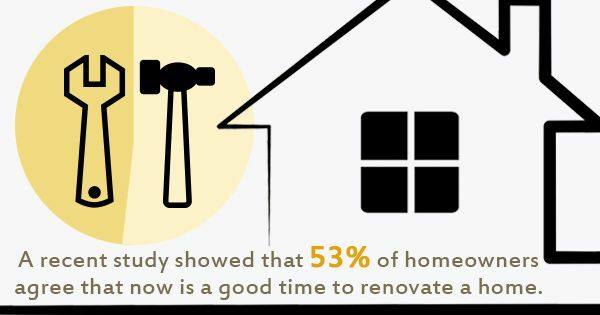 A recent study showed that 53% of homeowners agree that now is a good time to renovate a home, and more than 60% of homeowners are prepared to spend more in 2015 than those who renovated their homes in 2014. If you’ve been thinking about improving your home, but aren’t certain where to start, here are some of the most popular home remodeling ideas that will improve the value of your home. Bathroom remodeling is one of the most popular home remodeling projects in the United States, according to the National Association of Home Builders, totaling 78% of all renovations. Incorporating extra storage, such as an extra shelf in the shower, helps keep the bathroom tidy at all times. If you’re looking to add more light into your bathroom, consider installing frosted glass blocks. This will let in the sunlight while providing you with the privacy you desire. The kitchen is the room that sees the most action in the house. That’s why many homeowners look to remodel their small or outdated kitchens. Create a functional kitchen by adding a walk-in pantry, double sink, extra storage, or a larger tablespace. Modern kitchens are equipped with the newest ‘green’ appliances that can help reduce a homeowners impact on the environment and even save them money on their electricity bills. Garages are one of the best and easiest additions you can make to your home. Installing a garage takes little time, as there is no need for finished flooring and drywall, plumbing, or heating and cooling ducts. Garages can give your car protection against the environment, store your property, or even be turned into a great party venue. In addition, many insurance policies will lower a homeowners monthly car insurance bill if they store their cars in a garage.